On my way home after a disappointing performance. Several months of solid preparation and dedication were spoilt by poor bike maintenance. In fairness the problems with the derailleur were looked at by a mechanic and the stone embedded in my brand new tyre was beyond my control but failing to fix the puncture slowly and carefully cost me. Not using wet lube was an oversight but in my defence I had lubed the chain 24 hrs before the cycle. Now I am going to focus on La Geant (Mt Ventoux) and a few days later Le etape du tour. 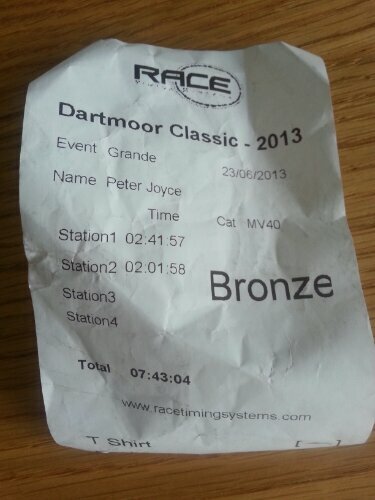 I will put Dartmoor out of my mind until sign on next October.